Launched in June 2015, the goal of OAR is to educate the public about the economic importance of the safe movement of hazardous materials by rail and to connect emergency first responders in Norfolk Southern communities with information and training resources. Our website, http://www.joinnsoar.com, has the following information (and a lot more) available at the touch of a mouse. Norfolk Southern's David Schoendorfer has received the Association of American Railroads' Holden-Proefrock Award for his significant contributions and career achievements to ensure the safe transport of hazardous materials by rail. 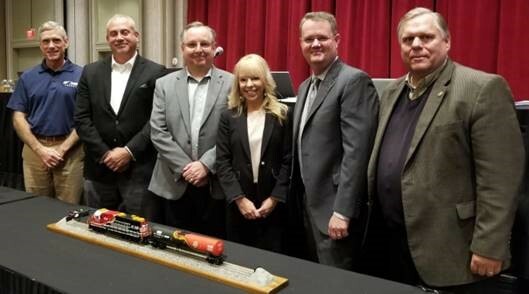 Schoendorfer, based in Atlanta as system manager hazardous materials, was presented the award on October 17th during a meeting of the AAR Tank Car Committee in Dallas. 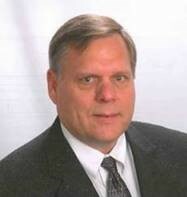 A certified hazardous materials manager, Shoendorfer currently chairs the AAR Hazardous Materials Committee. He is also chairman of the AAR AskRail Task Force and serves on the AAR Tank Car Committee, the AAR Spent Nuclear Fuel Task Force, and the National TRANSCAER Committee. "There are few individuals in the railroad industry who have decades of subject-matter expertise in hazardous materials transportation," said Rich Russell, NS' system director environmental protection. "David is one of those rare talents who can draw on over three decades of railroading and hazardous materials expertise for Norfolk Southern. His specialized institutional knowledge is leveraged on a daily basis for NS, and this lifetime achievement recognition is certainly well deserved." The AAR award Schoendorfer received recognizes an individual's lifetime contribution to safe transport of hazardous materials by rail. The award is named for Roy Holden and Art Proefrock, pioneers in hazmat transportation and emergency response. Schoendorfer is the award's 21st recipient. Previous Norfolk Southern winners include Tim Mannas, 2003, Tom Davis, 2008, Mike Stiner, 2012, and Paul Williams, 2017. Schoendorfer, who began his career in 1985 in the Transportation Department, has worked in the railroad hazmat field for the past 28 years. His current responsibilities include overseeing and providing emergency preparedness, emergency response, training, and regulatory compliance support across Norfolk Southern's 22-state system. Schoendorfer actively participates in NS' Operation Awareness and Response community outreach program. He played a key role in designing and helping to develop NS' safety train, which went into service in 2016. In addition, he has initiated many internal training programs to ensure hazmat employee compliance. As a leader on the industry''s AAR Task Force, Schoendorfer provided valuable input in the development of the AskRail first responder app, which now has over 25,000 users, giving first responders real-time information about hazmat content being transported in rail cars involved in an incident. Before joining Norfolk Southern, Schoendorfer served as an officer in the U.S. Marine Corps. He is a graduate of the Georgia Institute of Technology and the University of Pennsylvania. Scott Gould is a Norfolk Southern Hazardous Materials Compliance Officer for the Harrisburg Division, responsible for hazmat regulatory compliance, training, and emergency response within a multi-state territory. As a Pennsylvania native, Gould began his career as a private environmental contractor, specializing in hazmat railroad incidents throughout the Northeast. Prior to joining the Norfolk Southern HazMat team, Gould worked on high-profile rail incidents and managed various projects related to site remediation and industrial maintenance. When asked what he enjoyed most about being on the Norfolk Southern HazMat team, Gould responded, "Everything is different every day; no two days are ever the same. And I really enjoy working with the entire Norfolk Southern HazMat team. Everyone brings something different to the job." When he's not working, Gould enjoys spending weekends with his family in Bethlehem, PA. Norfolk Southern is fortunate to have Scott Gould on the HazMat team; stay tuned for the next NS OAR newsletter to meet another member! In April 2016, Norfolk Southern's Safety Train began service with a dedicated locomotive (NS 5642), 2 box car classrooms, 4 tank cars, and 2 specifically equipped flat cars to provide hands-on training. The Safety Train training sessions include the following topics: Safety on Railroad Property; Rail Shipping Documents; Rail Equipment Identification; Rail Tank Cars; Locomotive Fires; Flammable Liquid Unit Trains; Incident Response Procedures; Working with Railroad Officials; and the AskRail Mobile App. 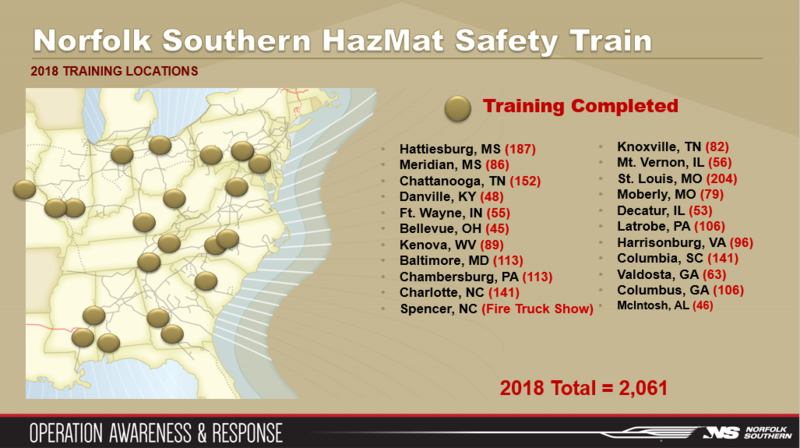 In 2018, the Norfolk Southern Safety Train made stops in 22 cities and trained more than 2,000 emergency responders. Over the past three years, the Norfolk Southern Safety Train has conducted training in over 60 cities system-wide. The 2019 training schedule will be posted soon and can be found at www.joinNSOAR.com under the Training tab. In July 2018, the Norfolk Southern Safety Train stopped in Edwardsville, IL., across the river from St. Louis, MO. Over the three-day training course, the St. Louis Fire Department sent multiple Engine Companies to the Safety Train training. Two of the Engine Companies that attended the training utilized what they learned later that day in their shift. 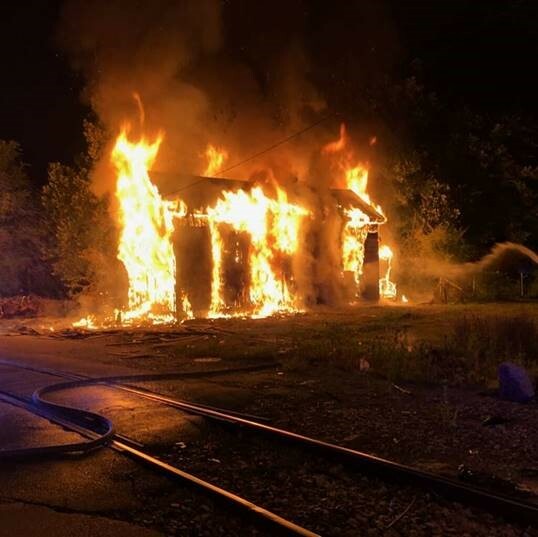 As Eng-33(A) pulled on the scene of a house fire, the Captain noticed they would have to stretch a line across railroad tracks to fight the fire. Remembering what he was taught earlier in the Safety Train training, the Captain located the blue sign at the crossing and contacted the railroad involved. The Captain notified the short line railroad that owned and operated the specific track of the incident and was able to stop all train traffic for the duration of the fire. The Captain commented to his crew that without the Safety Train training earlier in his shift, he wouldn't have contacted the short line railroad. Each year, Norfolk Southern trains thousands of first responders. 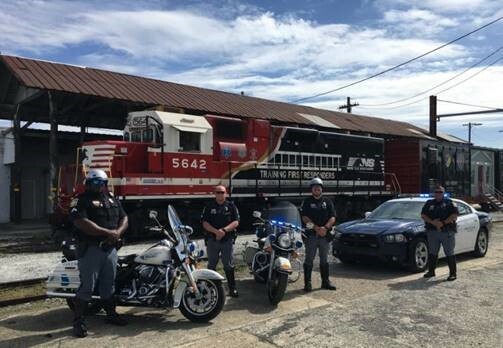 While Norfolk Southern hopes these first responders never need to use this training, Norfolk Southern recognizes the importance and impact it has in real incidents. This is "Why We Train". Hurricane Michael didn't stop the Norfolk Southern Safety Train from training first responders. While Valdosta, GA and surrounding communities stared down the barrel of Hurricane Michael, three days of training still kicked off on October 9th. Classes were canceled on October 10th as the storm passed through the area, but resumed again the following day. While attendance was affected by the storm, Norfolk Southern was still able to provide training to 70 first responders in the Valdosta area. The training involved topics that included Railroad 101, Rail Car Recognition, Locomotive Fires, and Handling Emergencies on the Railroad. The following week, the Norfolk Southern Safety Train made its way to Columbus, GA. Columbus was still recovering from the widespread destruction of Hurricane Michael and many local responders in the area were part of emergency task forces that provided emergency services and recovery efforts in surrounding states. However, 106 diligent first responders and government officials still managed to attend the training, representing Alabama, Georgia, and thirteen different agencies. Hydrogen Chloride Refrigerated Liquid (HCL-RL) is a time sensitive poisonous by inhalation hazard (PIH) commodity. In May 2018, the AAR filed a petition with PHMSA to remove the authorization for approved tank cars to transport HCL-RL because it has unique properties which make it unsuitable for transportation by rail. The pressure in tank cars of HCL-RL typically rises 8 to 12 psi per day during the summer depending on ambient temperature, and 6 to 10 psi per day during the winter depending on ambient temperature. Due to those characteristics, this PIH commodity will build pressure in transit and will be released from the tank car by design if the shipment does not reach its destination within a certain amount of time. Today, there are a low number of HCL-RL shipments by rail, so removing the authorization to ship by rail tank car will not have a significant economic impact on shippers. On the other hand, even these few shipments present an unacceptable (because it is unmanageable) risk to the railroads that are required to handle them, as well as the communities through which they travel. Norfolk Southern Recognizes Trinity Industries, Inc. In April 2016, Norfolk Southern unveiled a brand new safety train with a dedicated locomotive, specially equipped box cars, and several tank cars for hands-on training of emergency responders. After 3 years in service with visits to over 60 cities, thousands of emergency responders have been trained. At the Fall 2018 AAR Tank Car Committee meeting in Dallas, TX, NS recognized Trinity Industries, Inc. as an important partner in the NS OAR program. Trinity has donated the use of a brand new DOT-117 tank car. This is the new style of tank car used to transport flammable liquids, which has important safety features such as full-height head shields, a 9/16” tank, thermal protection, high-capacity safety relief devices, and a removal bottom outlet handle. To show them our appreciation of how much NS values this partnership, NS gave Trinity an O-scale model of both the NS 5642 locomotive and the Trinity tank car. Thanks Trinity for your contribution to “Make America Safe”. The City of O’Fallon, MO Emergency Management Agency saw a need for preparing its first responders and city officials for a railroad incident. Norfolk Southern owns tracks that run right through the middle of the city and close to city hall. EMA Director Pat Helton of the O’Fallon Police Department contacted NS Hazardous Compliance Officer Cris Burch to begin planning a table-top exercise in September. The objective was to involve the police department, fire department, emergency medical service, city employees, school district and St Charles County. The scenario involved an incident with a NS train in downtown O'Fallon. This exercise generated discussions about how to best respond to accidents in a more populated setting. These types of training exercises are vital to communities and first responders to understand the importance of adequately preparing for different types of incidents that could occur in their communities. 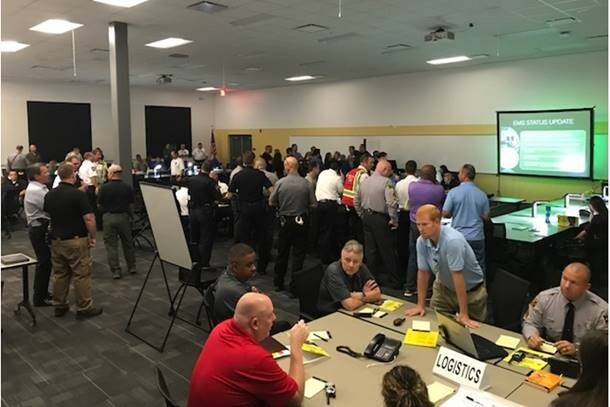 On August 14th, 2018, Norfolk Southern hosted 79 participants from many different emergency response agencies within Wake County, NC for a table-top exercise. Attendees included representatives from local fire and EMS departments, emergency managers, law enforcement officers, and surrounding hospitals. Exercises such as this table-top help emergency response agencies prepare for a derailment incident in their area, and gives them the opportunity to meet with the actual NS personnel they will be working directly with during those incidents. It opens dialogue where questions can be asked and further planning and preparation can be made, based on the outcome of the exercise. 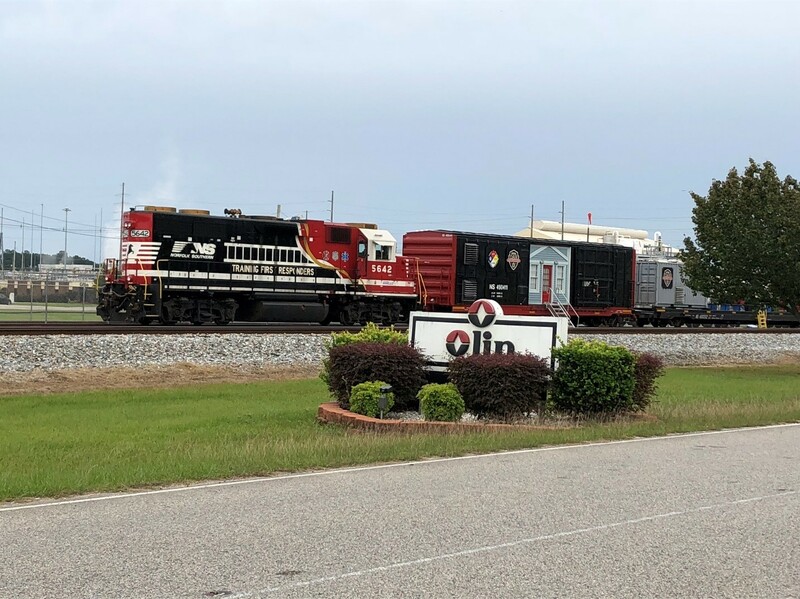 The Norfolk Southern Safety Train made its final stop for 2018 in front of the Olin facility in McIntosh Alabama. Even with inclement weather, the event drew a large number of plant personnel and contractors from the region, providing a great educational opportunity for personnel. 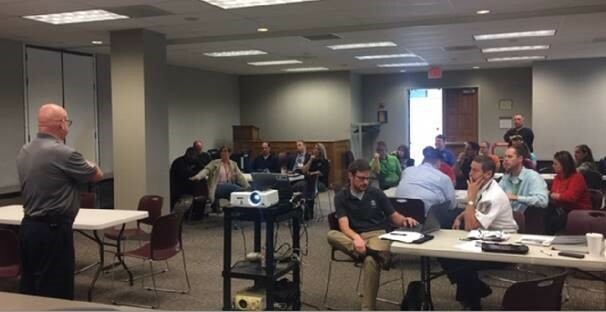 Members of the OLIN Ocean Team and Norfolk Southern's environmental contractors from USES, SPSI, HEPACO and MEI assisted in training personnel from the OLIN, AMVAC, Arkema, Nouryon, and others in programs to enhance their understanding of railroad safety and response. Employees learned how to safely work around railroad right of way, respond to incidents, and understand basic railroad terminology. Additionally, participants got the opportunity to see the workings of specification tank cars, various protective housings, and accessories found in those protective housings. What Happens When a Call Comes Into CHEMTREC®? In 10 Seconds How Can You Tell if a Tank Car is Fully Loaded? What are the Emergency Response Kits for Chlorine Emergency Response? HazMat Incident: What are the First Things I Do? What Are The Levels of PPE? Copyright © 2017 Norfolk Souther Corporation, All rights reserved.